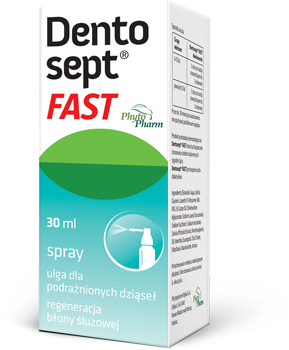 Dentosept® FAST is a preparation used for the care and protection of the oral mucosa and gums. With the innovative spray applicator, it can always provide relief for your gums when such a need arises and do it in a fast, easy, and discreet manner. The applicator allows you to reach precisely and comfortably any place in the oral cavity. Recommended when the proper oral hygiene is fundamental to keeping the oral mucosa in the proper condition, particularly: when there is increased proneness to irritations, when there is microdamage, after extraction of a tooth, and after other dental procedures. Dentosept® FAST has antibacterial and alleviating effects on gums and oral mucosa, facilitates regeneration of gums, helps maintain fresh breath, also in case of halitosis. Chlorhexidine has antibacterial effects to care and protect the oral mucosa, preventing inflammations. Sage extract is an adstringent and contributes to the antibacterial effects. Vitamins B2 and B3 contained in the product facilitates the regeneration of gums. Glycerine creates a protective layer on the oral mucosa and ensures proper lubrication. Dentosept® FAST creates conditions for better regeneration of the mucosa and helps people suffering from dry mouth live more comfortably. Thanks to the content of mint oil and eucalyptus extract, the product helps clean the oral cavity and has refreshing effects. Zinc citrate enhances the refreshing effects. Xylitol protects the tooth enamel against caries. Do not eat or drink for ca. 30 min after application.